Two-million dollars doesn't seem like much money, until you realize this was in 1904. That translates to $50M in 2013 money, which still isn't a lot of money when you remember cars like the Veyron cost $1M. "Steerable ballon"? 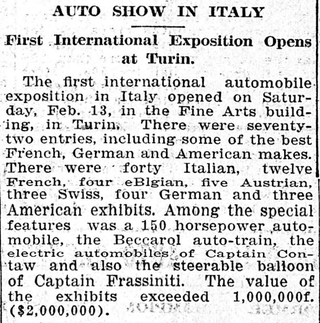 This sounds like my kind of car show. "Look! Bob Lutz is on the Ren Cen wearing a new hydrogen Chinese-built jetpack!" As you may have guessed I spend my nights reading old (very old) newspapers. They are often filled with funny stories and absurd automotive ads; but they are also a raw look at history and aren't edited for 2013 web consumption. Many of these are first hand accounts written in a style long forgotten by most. They offer a true sense of 'being there' that you don't get from traditional historical accounts like Wikipedia. If you ever get a chance, go to the Library of Congress' website and dig through a few old papers. You'd be surprised how fun (and addictive) it really can be.